I have seen the original Star Wars trilogy (Star Wars, The Empire Strikes Back and The Return of the Jedi). I started watching Episode 1, but didn't finish it and didn't watch its sequels. But now I want to watch The Force Awakens and The Last Jedi. Do I need to watch Episodes 1-3 or can I fully enjoy and understand the new movies without having seen them? No. It is not necessary to watch episodes I-III. Having seen all the films released to date, I can definitely say that you can enjoy Force Awakens without needing to see Episodes I, II, and III. There are a couple of little in jokes, but you won't notice them, and they don't detract from the plot. If you're planning on watching Rogue One, it does help to have seen Episode III to link to a single moment, but it's not critical. Obviously I can't be certain about Last Jedi, but its unlikely you'll need anything from the prequels to enjoy it. I will expand on kappa's answer on the order watching question in order to provide an answer here. The short answer is NO, you don't HAVE to watch Episodes 1-3 in order to enjoy Episode 7 (and presumably Episode 8, but it's too early to tell). Episode 7 does a very good job of taking the universe as it was established in the previous movies and expanding on them. While no particular plot point depends on having previous knowledge, knowing how things evolved adds a lot of depth to the decisions that characters make in the series. However, The Force Awakens, because it is both a family saga story and uses "ring" story telling, does in fact incorporate elements and juxtaposes all six previous saga films. This is done to better define Star Wars Saga films and establish its themes. There is no Wikipedia on "ring storytelling" but more or less it's a construction theory (Ring Theory/Chiastic Structure) that relates to the way Star Wars has been designed/constructed to "echo" itself with either circular and/or parallel story telling. Note: The link above provides much insight into Star Wars' first two trilogies specifically, and much like this question, it points out even why The Phantom Menace is important to the series as a whole. One clear example in Star Wars Saga is: Each first film, in each trilogy, features a protagonist witnessing an older beloved "good" character die in battle with a villainous character, which is used to push the story forward, usually through the protagonist watching. A New Hope: Luke Skywalker witness Obi-Wan Kenobi be killed by fighting Darth Vader, which pushes him to follow through on becoming a Jedi and dealing with Vader. Rey (Finn and Chewbacca) witness Han Solo be killed by Kylo Ren, pushes Rey to stay the course and find Luke. Note: The differences are the amounts of people witnessing the older good character's deaths and that older Obi-Wan chooses to die, rather than be killed in A New Hope, but The Force Awakens shows the most variation, as this battle is not between multiple force users like the previous two, but it also juxtaposes scenes from Empire Strikes Back and Attack of Clones by being "on bridges", and the battle at the end of The Return of the Jedi being a "father and son" conflict. Rey's existence on Jakku for instance, is closer to, but really is worse than, Anakin's and Shmi's on Tatooine, than Luke's, and is highlighting a similar story with upbringings of repression. 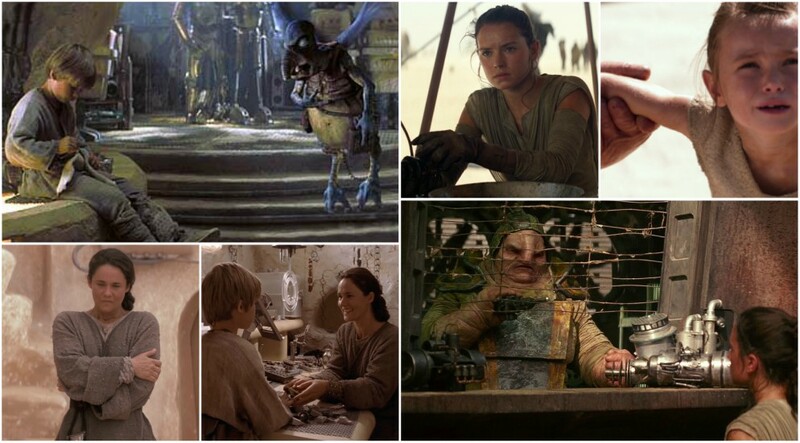 (One may even speculate that Shmi's early life before having Anakin, could have looked a lot like Rey's depending on when she became Watto's slave and/or how she could have existed before becoming a slave). Like [child] Anakin also (The Phantom Menace), Rey is afraid to leave home, in relation to family. Luke looses his family and has nothing to gain by staying. 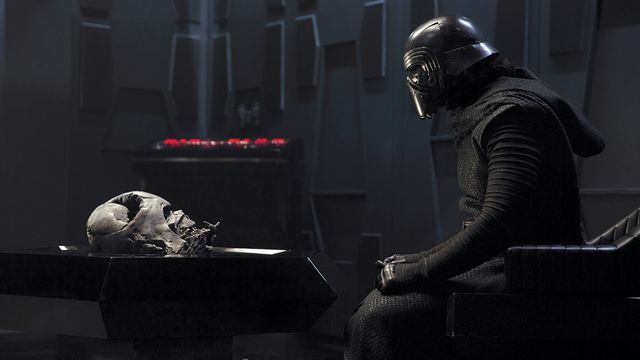 Kylo Ren also conveys parallels with teenage+ Anakin himself in terms of fits of rage, seemingly being on the dark side and serving a high ranking official, and because, for whatever yet to be disclosed reason, he believes he is supposed to "finish" what Darth Vader started and seems to be trying to communicate to Vader from the beyond. It should be noted though he was corrupted at a lot younger age than Anakin. There is also Anakin's Lightsaber from Revenge of the Sith that Luke once had, but lost in the Empire Strikes Back. The Last Jedi ends up being rather unusual for a Star Wars film in this particular section of it's franchise, because it operates on a theme of uncertainty and series of ruse, whose definitive meanings are yet to be established, because more questions are raised, then "solid" answers have been given. The theme of uncertainty ties into the franchise in a few ways, such as with the prequels with Anakin's turn to the Dark Side and the fall of The Republic & Jedi. The Jedi's fall being furthered by a lack of transparency on their part, not being able to live up to their own standards (for various reasons), and through philosophical critiquing of the Jedi belief system pushed by Palpatine through Anakin's over emotional nature (chosen one = high midichlorian count) and sometimes tragic experiences. In addition the theme of uncertainty was probably felt through the presentation of Darth Vader when he first was seen on screen in 1977, and furthered by the revelation of Luke's (and Leia's) parentage. With that being said, I feel one can not begin appreciate what The Last Jedi offers without seeing either the Original Trilogy and The Prequels. Like Daughter, Like Mother. Leia looks out over the battlefield towards the end of The Last Jedi. There is a nearly identical shot of Padmé featured in The Phantom Menace. Golden Age Hollywood Aesthic or character types - Canto Bight Patrons have a 30's-50's elitist look to them (this part of TLJ was inspired by To Catch A Thief) Throughout the prequels there are other elements, such as some Art Nouveau Motifs on Naboo (The Phantom Menace) or the casting choice of Christopher Lee channeling Gothic-Horror Byronic Hero types of 40's & 50's Horror cinema ("Count" Dooku in similitude with someone like "Count" Dracula, which Lee played Dracula in 1958). "Laser Sword" & Spin Piloting Maneuver - The terminology laser sword, referring to lightsabers, was uttered by Luke on Ach-to was first used by young Anakin Skywalker. Anakin Skywalker also used a spinning piloting maneuver the same as Kylo Ren. 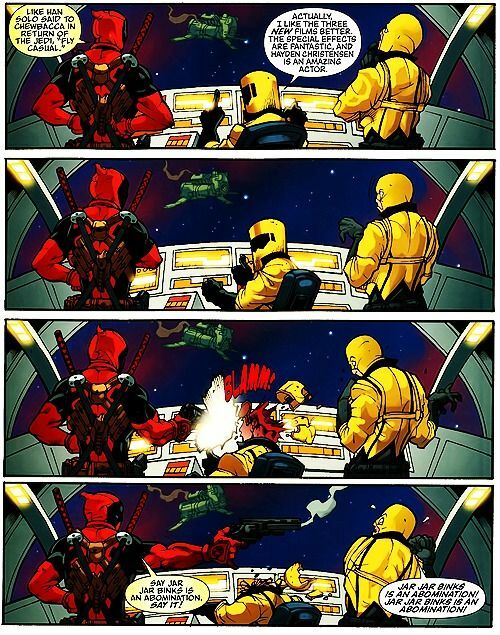 (The Phantom Menace). Seismic Charges (noise) - There is a noise made when Holdo does her daring maneuver. This seismic charge noise was also featured with a scene with Jango Fett in Attack of the Clones. Luke Skywalker refers to Darth Sidious by his more commonly used prequel-era name, Palpatine. 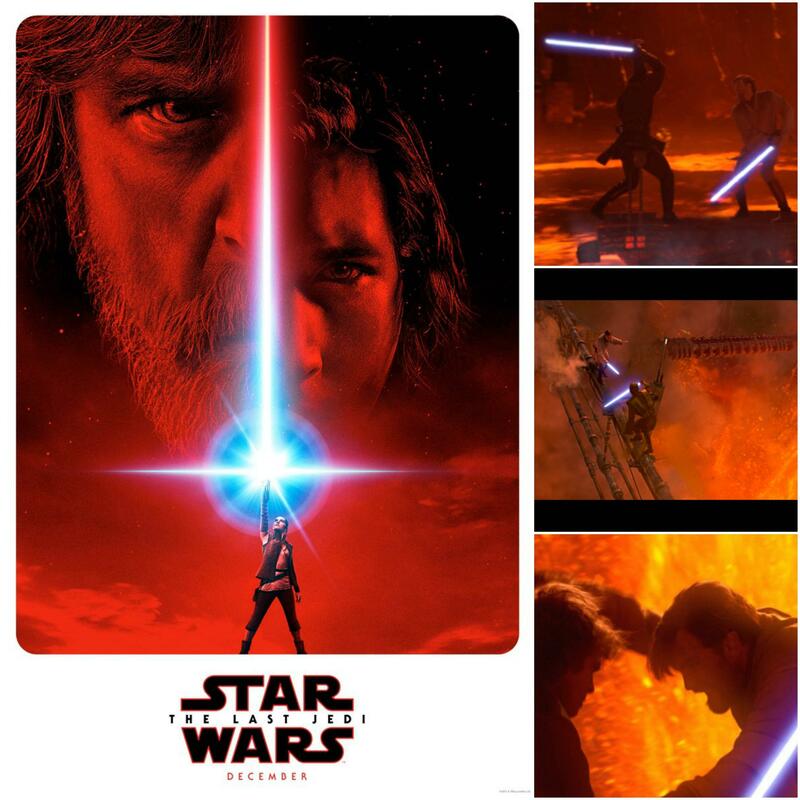 Ideas such as Rey being the 'light that rises up to meet the darkness' and Snoke suggesting that Rey and Kylo Ren in some way equivocate "the balance of the force" is reminiscent to the Prophecy of Anakin Skywalker being "The Chosen One" (The Phantom Menace, Revenge of the Sith). The surprising departure of Supreme Leader Snoke is also similar to the near-death departure of Darth Maul (The Phantom Menace). ...Kylo was left kneeling on the plains of Crait, with the illusion of Han Solo's dice fading away and him "looking out" at Rey almost longingly before she departed with the other surviving Resistance members. As it turns out, when director Rian Johnson was writing Kylo's last scene in The Last Jedi, he was inspired by the moment in Revenge of the Sith when Anakin was transformed into the cybernetic Darth Vader. Watched Last Jedi last night and can confirm that nothing of note in the prequel trilogy is referenced in the movie. There are a couple of references to some events in Revenge of the Sith, but the references don't need you to have seen the film to understand it. Is it necessary to watch Episodes 1-3 before watching “The Force Awakens” and “The Last Jedi”? Do I need to watch Episodes 1-3 or can I fully enjoy and understand the new movies without having seen them? You do not need episodes 1-3 to "enjoy and understand" The Force Awakens or The Last Jedi. It is not "necessary" to watch them. As is, The Force Awakens and The Last Jedi stand on their own without 1-6 or Rogue One. The back story of episodes 4-6 are more directly relevant, but episodes 1-3 are less so. Consistent with the "kill the past" theme in The Last Jedi, TFA and TLJ stand on their own without the previous films. You will, however, want to watch The Force Awakens prior to The Last Jedi as TLJ is a direct sequel to TFA. Your appreciation of the "Star Wars" world and all the side characters will certainly be enhanced, but the narrative supporting TFA's main character (Ren) and main supporting character (Finn) doesn't require any of the other films. All a movie needs is an epic hero, a believable world and interesting side-characters. By that standard, The Force Awakens and The Last Jedi are both movies which can be enjoyed and understood without watching episodes 1-3. If you could not bear watching episode 1, then there is simply no good reason at all to watch episodes 1, 2, and 3. That which you could not bear in episode 1 is repeated and expanded upon ad nauseum. You won't miss a thing in terms of story and given your dislike, watching them may otherwise detract from your enjoyment of the others. You can do just as well to read the plot summaries on imdb dot com or wikipedia. Not the answer you're looking for? Browse other questions tagged star-wars the-force-awakens suggested-order . Is it necessary to watch Star Wars: Episode III - Revenge of the Sith before embarking on Star Wars: Episode VII - The Force Awakens? How much of Star Wars did George Lucas actually write? Why does The Force Awakens not use the Episode notation? How can Maz have Luke's lightsaber in Star Wars VII? Why does “The Force Awakens” use an image language associated with national socialism for the First Order? Why are there such large gaps in the Star Wars release timelines?